The Islam Awareness Blog: Where are the Girls in this Mosque? I was shopping in another part of Toronto the other day, accompanied by my siblings, and it was time for the Maghreb prayer. There was a big mosque nearby and we drove there. There was one entrance called "Sisters' Entrance", my sister entered from there, while my brother and I walked around the mosque to enter via the main entrance - aka the "brother's entrance". It was a very nice, huge, ornate, well designed mosque. It was also quite new; the mosque used to be two portables fitting around 40 people before, now this was a proper mosque accomodating thousands. The main prayers were over; so my brother and I prayed by ourselves. 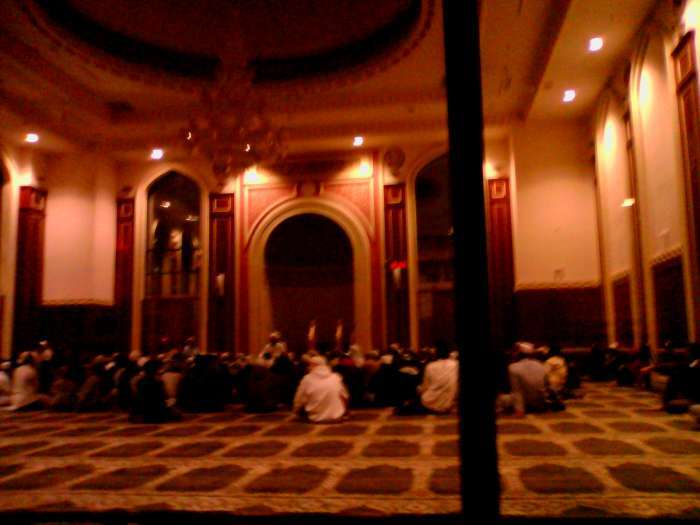 The main prayer hall was divided into two sections - a glass barrier separating the dimly lit "private" space from the main hall - this is where we prayed. The sisters' area was upstairs. Everyone shown around the speaker is a male. The adults were male, the kids were male, and of course the speaker was male. Where are the females. "Oh, they are upstairs, listening too," Answered someone, when I asked them. "We have speakers and close circuit TV." This is the problem, the big problem, in today's Muslim organizations. 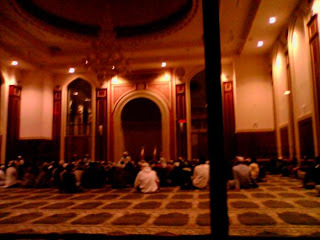 If you take a look at this picure, there is a LOT of empty space behind the men, in the MAIN prayer hall. Why can't girls sit here, in close proximity to the speaker, so they can personally ask him questions, or be inspired in way that only a face-to-face conversation can? Sitting behind the men will satisfy any requirements that orthodox Muslims can throw at them, and not to mention, teaching women this way is actually a sunnah. I remember going to these classes, sometimes as a kid, often as an adult, when a well known speaker would come to the mosque, and being inspired by the Islamic knowledge imparted. If my sister or wife would attend, sometimes I would wonder why they were not similarly impressed. Hard to be impressed when you are looking at a curtain, I think! I was reading Cartoon Muhammad's article "The Need for Muslim Women Leaders". He is on the mark on how certain segments of the mosque community (let's be candid - it's the more "religious" folk) who construct barriers (literally and figuratively) against Muslim women speakers. However, the problem that I saw in this mosque, in this dars, prevent women from seeking knowledge in the first place. Muslim Student Associations all across Canada talk about Israel Apartheid, but we have to be honest and admit there remains an Apartheid system in many of our mosques that discriminate against half our community - the girls. Contrast this to the times of Caliph Umar (the Caliph of the Muslim empire!) being corrected by a woman during a Friday Khutbah! Or even contrast this with the Sayeda Khadija Centre in Mississauga, Ontario. When I was there, the first few rows were occupied by men, and the next few rows were occupied by women. Sisters conversed with the imam (who was standing, in person, a mere 50 feet away from them). And this was no progressive "flaky" imam, this was Imam Hamid Slimi who also teaches at the prestigious Islamic Institute of Toronto.